Foreign investors have dived back into Chinese stocks; Hong Kong-listed shares trade at a rare premium to their onshore equivalents. Newly announced reforms strengthen the case for equities, notably insurers and brokerages, but investors are ignoring some obvious contradictions. 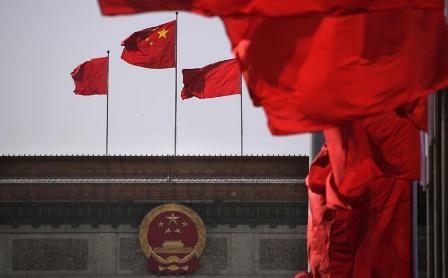 Chinese national flags flutter in front of the Great Hall of the People before the opening ceremony of Chinese People's Political Consultative Conference (CPPCC) in Beijing March 3, 2013. Three questions to ask of China’s "third plenum"
Chinese stocks rose on Nov. 18, the first trading day after a lengthy 60-point reform plan was released by the ruling Communist Party. Hong Kong’s Hang Seng Index was up 2.3 percent by 3 p.m. (GMT 0700) in Hong Kong, while the China Enterprise Index of mainland Chinese stocks listed in Hong Kong was up 5.1 percent, driven by shares of insurance companies and securities brokerages. The Hang Seng China AH Premium Index, which shows the relative performance of onshore listed shares versus their Hong Kong-listed equivalents, fell as low as 93.9, its lowest level since January 2011. A reading below 100 shows Hong Kong shares trading at a premium; the index has mostly been above 100 since 2008. The China reform blueprint vowed to improve the financial system and create a “multi-level” capital market, including improving the process for registering new shares. New listings are currently subject to individual approval by the China Securities Regulatory Commission. There has been no initial public offering on mainland markets in 2013.